Japanese food has plenty to offer for the vegetarian and vegan eater! Here are a few Japanese food recipes to introduce you the meatless options in Japanese cuisine. Of course, my favorite thing about being a vegetarian when visiting Japan is the vegetarian sushi that seems to be everywhere! Vegetable tempura is a vegetarian option that's usually available at most Japanese restaurants. 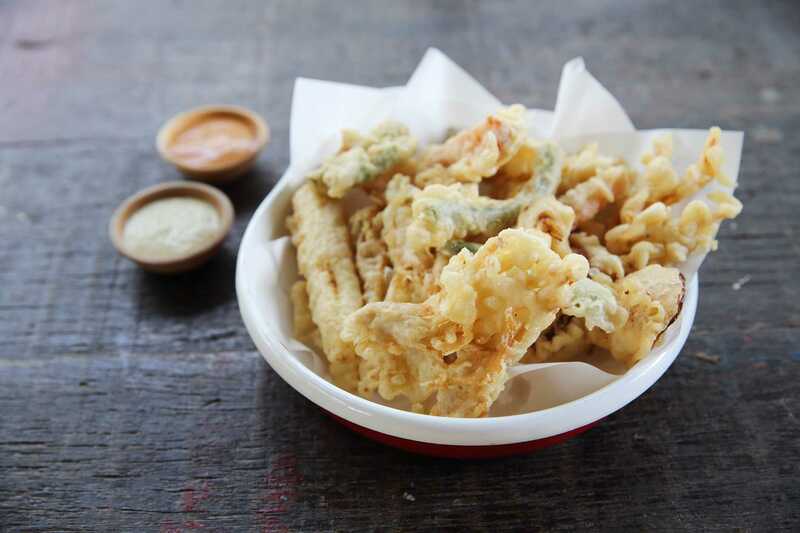 Even if you avoid fried foods, tempura is light and crisp, rather than greasy, so you'll find it not quite as heavy as French fries or other deep-fried foods. It only fries for a minute or two, rather than until inundated with oil. The veggies should still be a bit crunchy! Japanese tempura batter at restaurants will often, though not always, contain eggs, but it's quite easy to make egg-free vegan tempura at home. Japanese cuisine calls these little vegan mushroom and tofu potstickers "gyoza", and while they may be steamed or fried in Chinese cuisine, they're usually pan-fried on just one side in Japanese cuisine. They're delicious at restaurants, and occasionally you can find them in the frozen food section of Asian grocers or natural food stores. If you want to try making your own, our vegetarian version with mushrooms, tofu, and scallions is a good place to start. No exploration of Japanese vegan food would be complete without some vegetarian udon noodle soup. In this flavorful recipe, ginger, vinegar and soy sauce simmer together with udon noodles, scallions, and fresh cilantro. Yum! Japanese edamame is a staple at most Japanese restaurants, and they're the perfect anytime snack for vegetarians and vegans. They're great whether fresh or frozen and full of healthy soy protein. Edamame is the perfect Japanese food for vegetarians and vegans! No recipe needed - just boil or steam, add a bit of salt and enjoy. You can't go wrong. Miso soup is another one of the foods you'll find at just about every Japanese restaurant, and it is usually, though not always, vegetarian (and vegan). The basic ingredients are miso, seaweed, and tofu, and a little soy sauce, sesame oil, or other seasonings flavor the simple broth. Vegetarians and vegans can enjoy miso soup, three ways, as it's one of the quickest and easiest Japanese food dishes to create. If you're new to Japanese cooking, this is a great recipe to try, as it uses a pre-made store-bought curry roux to simmer up vegetables in a Japanese eggplant curry. You can slurp up this meal just as it is, add rice, pour it over noodles, or, if you like a heartier meal, add some chunks of fried tofu or another mock meat. Soba noodles, made from buckwheat flour are a common ingredient in Japanese cuisine, often served in a plain broth, or in a chilled salad. Soba is the base for a number of traditional Japanese dishes, a handful of which are vegetarian, but of course, you can prepare your soba noodles any way you choose. In our Japanese soba noodle recipe, traditional ingredients, including sesame oil, rice vinegar, and shiitake mushrooms flavor the noodles, which are served chilled, as a salad. Plenty of garlic and ginger spice up our Japanese macrobiotic vegetarian and vegan soba noodle soup recipe, and shredded Napa cabbage and shiitake mushrooms round out the soba noodles.